UNISON does more than just support its members in the workplace. Through your membership you are part of the UNISON family. 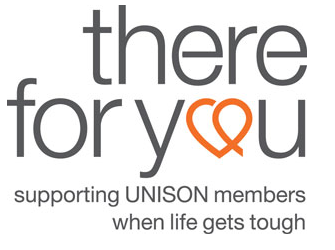 Families look out for each other, and for members facing tough times UNISON runs a part of the union called There for you to help. If you are a member and you are experiencing financial or emotional difficulties, whatever the circumstances, There for You offers a confidential advice and support service. There is no guarantee that we can offer you financial help, but thousands of members and their families do benefit from our support every year. For example, in 2012, There for You gave more than 4,000 grants to members totalling nearly £750,000. This might be help with credit card debts, purchasing white goods, or support to have a break. For more information call 020 7121 5620 or email thereforyou@unison.co.uk or contact the West Sussex branch welfare officer, Stuart Gibbons through the branch office. Download an application form as a Word document. As well as the national There for you grant programme, the West Sussex branch also runs its own smaller funding pot to support members who fall on hard times.